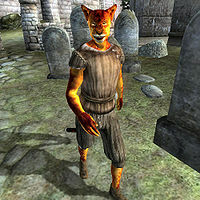 Ra'Jahirr is a Khajiit enforcer living in Leyawiin. He wakes up at 6am and heads directly to Five Claws Lodge for a two-hour breakfast. He leaves at 8am and wanders around the southern part of town, while chatting with the other citizens. Between noon and 2pm, he can be found browsing in the Best Goods and Guarantees. After that, he pays a visit to the graveyard behind The Great Chapel of Zenithar where he spends two hours paying his respects to the dead. At 4pm, he once again takes a stroll around town, this time near the House for Sale, until 8pm when he returns to the Five Claws Lodge for drinks and socializing. At midnight he returns home and goes directly to bed. On rainy days, he will cancel all outdoor activities and stay at home. The exception to this daily routine occurs once the Drunk and Disorderly quest is initiated. To avoid the drunken, restless Fighters Guild members terrorizing the Five Claws Lodge, Ra'Jahirr will skip both his 6am breakfast and his evening visit to the Lodge and stay inside his house. Ra'Jahirr wears a lower-class outfit consisting of a belted vest, breeches, and a pair of pigskin shoes. He carries the key to his house, as well as a few pieces of gold. Esta página foi modificada pela última vez à(s) 05h43min de 20 de outubro de 2015.